A a few years ago I read an account by a feminist helping out in Africa to implement birth control measures. The woman recounted a conversation with an African mother of six, aged about 35, who asked her about her life in the US. "How many children do you have?" she asked, and the American woman, also aged about 35, said that she had none. The African woman exclaimed: "But how will you live?" The American thought that to be humorous and indicative of to what extent African women were indoctrinated to be prolific. It does take someone from an underdeveloped nation to point out the obvious: if there are no children, we all will perish. However, that point was obviously lost on the American woman, obsessed as she was with her "missionary" work, spreading the culture of death throughout a nation that can ill afford to be deprived of the only means of survival, its children. In a nation in which there are no or only insufficient social support programs, children are life, the only means to survive. In the developed nations, ostensibly still blessed with wealth (although that is rapidly shrinking and being replaced by massive government debts), social support programs are still ample. Still, even in the developed nations the success and survival of the social support programs in place depend on our children, even if they are the children that others here or in Third World countries make the sacrifices to bear and raise. The press release doesn't do the report justice, because one of the most important issues covered in the report is mentioned only in passing: "The paper recommends that employers, ...Focus on creating more family-friendly work environments." The reasons are, amongst others, that 40% of women in professional jobs have not started a family because of work; and that 30% of men said they wanted no children, for the same reason. This paper uses data from Duxbury and Higgin[s's] 1991 and 2001 work and family studies to examine this and other related issues by asking: Has work life balance become more difficult for Canadians over the decade? How does work-life balance affect quality of life and organizational performance? What factors have the biggest impact on achieving balance? What can be done to help employees balance the demands of work and family? The 1990s Was a Decade of Change, but Many Changes Were for the "Worse"
Those groups who are at greatest risk for high work to family interference differ from those most at risk for high role overload. Whereas women are more likely than men to report high role overload, men are more likely to report high levels of work to family conflict. This finding is consistent with other research in the area suggesting that for many men, placing family ahead of work continues to be deemed a "career limiting move." While married employees are at greater risk of high work to family interference than those who are single, the differences between parents and non-parents is not as marked as the one observed with respect to role overload. While those with preschoolers tend to experience the highest levels of overload, high interference from work to family appears to peak when children are in school but cannot legally be left alone and unattended. Employees with eldercare responsibilities also appear to be at high risk of experiencing high work to family interference. Family type is also a predictor of high work to family interference. While being in a "traditional" family (i.e. homemaker spouse) seems to partially protect the male breadwinner from high levels of role overload, the data suggests that those in this family situation are at greater risk of experiencing high work to family interference. Other family types, such as those where male and female partners are not "equally" employed, are also likely to report high work to family conflict. It may be that in these families, there is less appreciation (or understanding) of what the other partner does and / or the types of support they need. Moreover, men in these families may feel extra pressure to address their family responsibilities by being successful at work. Finally, dual-earner employees (with or without children) experience lower levels of work to family interference than those families where one or both partners are in professional positions. This finding suggests that the psychological demands associated with professional positions, and perhaps the greater desire to "get ahead," may contribute to work being placed ahead of family. I became interested in the report because Ted Byfield used some facts stated in it as the lead-in to his commentary "Health Canada inadvertently discloses facts Planned Parenthood would like to suppress," in the Mar. 4, 2002 issue of the Report Newsmagazine (p. 60). The report shows the major motivating force behind the epidemic of a shrinking population sector of children that will eventually have to support a growing population sector of the elderly. That trend is now firmly entrenched, world-wide, and not just confined to the developed nations. The developed nations are entering an era where one in two people of working age will have to support one retiree  with many less-developed and underdeveloped nations increasingly having to worry about that as well. Strive to be model employers. As the largest employer in the country, the federal government (and provincial and municipal counterparts) should set a positive example in the area of work-life balance. Being seen as a model employer will give governments the moral high ground to expect, and request, changes in this area from other employers. Develop and implement a national child care program that addresses the needs of children of all ages. Develop and implement a national elder care program. Implement labour legislation that includes specific language around long-term unpaid leave for the care of a parent. Recommendation 23 is of course nothing other than a necessary attempt to shift the burden of caring for the elderly back from being a responsibility of the government to become once more a responsibility of families, families that, ever since the governments of the developed nations began to systematically dismantle them, now no longer exist in sufficient numbers and sizes to be able to take over that task from the governments' failing and collapsing social programs. 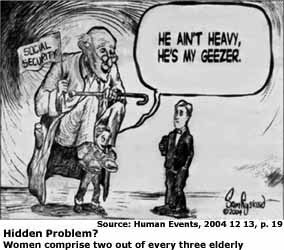 Not just families are to shoulder the burden of doing what the social programs in the developed nations no longer can do sufficiently well, but the governments are to become the leading examples for employers to shoulder the financial costs of that as well. All of that is, of course, wishful thinking. From where are the governments, already consuming close to 60 percent of the Canadian gross domestic product, supposed to get the financial resources to do it with? Higher taxation is the only possible means. That means that families and other income earners must shoulder the burden of paying the governments to enable their employees to do what, once upon a time, families used to do for free, provide child care, care for the elderly and for the disabled. And on account of the shining examples that they set, the governments will then be able to take the moral high road to create legislation that will force employers in private industry to enable their employees as well to be as generously provided for as government employees are. Where will the employers in the private sector find the money to pay for family responsibilities? There'll be taxpayer-funded grants and incentives, no doubt, but once the legislation is in place, the governments, always short of money, will surely cut back on or eliminate those grants and incentives, to leave the employers shouldering the costs the legislation will impose on them. That means that the taxpayers and consumers must face not only higher taxes but increasing costs of consumer goods and services. The limit will not be set by our ability to work but by our ability to pay, and in a steadily shrinking job market the ability to pay will be increasingly more difficult to come by. Even if European fertility rates [currently at 1.4] were to return to 2.1 [required to maintain zero population growth] tomorrowa virtual impossibilityEurope's current population of 727 million would still drop by 171 million by 2050. All this, needless to say, is bad news for an organization like Planned Parenthood ....the United Nations has been so successful in its don't-have-kids propaganda that it is rapidly making the absence of kids the world's No. 1 economic problem. Meanwhile in Europe, where one government after another experiments with costly child-bearing incentives, the universal experience is that bribes don't work. Women must want to have children. So why don't they? And why do men readily concur? Because, the Canadian study finds, they both make their work more important. And this, we may discover, is a very difficult mindset to change. Of course, as long as government-sponsored studies such as those by Duxbury and Higgins perpetuate the government policies of family bashing, and as long as the governments still persist in criminalizing parenthood, that mindset will not soon change to the better. Civilization, the symbiosis of family and society, is a very fragile thing. It took more than 10,000 years since it came into existence to bring us to a point where we could exist in harmony and comfort, with all population sectors nicely balanced. However, during the past 30 years and more, that fragile symbiosis has been largely and deliberately destroyed. For the first time in the 10,000-year-history of civilization families are being persecuted and destroyed through large-scale programs for the systematic removal of their weakest links, fathers. Moreover, intact families are being burdened with punitive taxation rather than having all of society help families with their enormous sacrifices they make in raising children  the children who'll be the sole means of support for the elderly a generation hence, whether those elderly-to-be presently have children or not. It is not fair to put all of the blame on men and women for whom children don't fit into their lifestyles, but that mindset is not likely to change for quite some time to come. The consequences are not nice, to say the least, but there is a solution. We have to eliminate government support for those organizations and institutions that presently and in the future promote family-hostile policies. Once we don't punish people anymore for wanting to have families, they will most likely want to raise children again. Ten thousand years of history can't be all wrong, contrary to what family-hostile social engineers tell us. Note: It is quite likely that even the Low-variant projection is overly optimistic, because the UN's information doesn't appear to reflect sufficiently that birth rates are in serious decline in many nations, nor does it seem to take into account the full extent of vastly decreased life expectancies due to the world AIDS epidemic, which in some localities has infected up to between one- to two-thirds of the population. PS. In a report that deals with the shrinking net worth of Canadian individuals and families, and with the shrinking purchasing power of Canadian incomes and wealth, it is identified that the major share of the burden of the shifting wealth distribution is being borne by families, predominantly by single-income-earner families with children. That report points out that families that were just barely getting by 16 years ago are now increasingly likely to be in debt, and that families that still had a little bit of positive net worth 16 years ago now are more likely to have none or to be in debt, while the net worth of all except the very few in the top one- or five percent of the wealth distribution now have a net worth that has shrunk by a considerable margin. That has nothing to do with mindset but everything with the realities of punitive, family-hostile policies, and with the escalating taxation required to fund failing social programs. The feminist dominated government administration of Canada successfully censored the report out of existence. The government web page containing it cannot even be found in the Internet archives anymore. Fortunately the report is still accessible at other locations. Go directly to the location from where the document can be downloaded. That document contains an overview compiled from various sources, based on various opinions relating to the consequences of the U.S.-promoted culture of death resulting from National Security Study Memorandum 200, by Henry A. Kissinger, National Security Council, Washington, D.C. 20506, April 24, 1974.